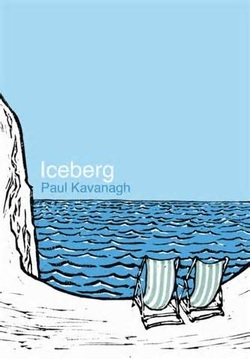 Paul Kavanagh’s writing is inimitable, and his novel Iceberg resists both summary and analogy, says David Rose in his review blurb on Honest Publishing’s website, which appears directly below the summary. An enthused commenter suggests ‘hoovering’ is a neologism. I disagree. After I write this, I’m going to open red wine. On page 62, Don removes his rucksack, leans it against the wall and searches for a bottle of wine. This sentence is repeated as the next line of the next paragraph. I wasn’t sure by that point if it was intentional. Open to any random page, like where they get malaria and meet a doctor: “A Norwegian doctor visited them in their motel. He was a tall man with lapis lazuli eyes and blond hair. His soft voice was pleasant after the engines of lorries, cars and motorbikes. […] Phoebe started. […] Don looked.” I get the post-postmodernist juxtaposition of simple repetitive sentences against an increasingly dissociative plot, a style that attempts to avoid promoting good feelings and produces a trance-like state. There’s quite a lot of it in print, my argument against the use of the word inimitable. In Iceberg it predominates the changing landscape and colorful peripheral characters so as to make me curiously numb to Don and Phoebe’s kaleidoscopic equanimity timeline. Is that how I’m supposed to feel? Happily, Kavanagh peppers his diction with lexical swerves, in the form of funny dialogue, poetic descriptive microparagraphs – “Palm trees sprouted from pools of abandoned seawater” – and sudden vocabulary. When Don goes to a wave-beaten bar in Elmina for three rounds of drinks, the bartender is first ‘rachitic’, then ‘hypnagogic’ and lastly feared to have narcolepsy, lashings of sesquipedalian loquaciousness I quite enjoyed. Although, in the case of: “Don watched the virga over the buildings sway and hold the sunlight. It was a soporific picture. // Kristian sat down and sipped his coffee.” the device clangs loudly, and if I may say so, somewhat solipsistically. But that’s just me. 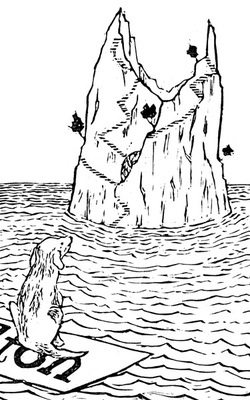 The third section, about life on the iceberg itself, changes form to huge, unbroken paragraphs of dialogue and description – perhaps to mimic the cover illustration of the berg? It’s a perplexing choice. Don and Phoebe’s denouement is original and charming enough, and certainly different enough from the grim Northern and grim African sections of the novel, to not need this distancing, textural shift. I couldn’t tell if it was meant to slow the story down or speed it up. Or what. A lot happens in Iceberg. In 116 small pages Don and Phoebe’s world changes, as do they while somehow sort of staying the same. Maybe I should read it again.